Most of us use our smartphones to snap photos of people, food, the sky and various random stuff, and then share them on Twitter, Facebook, Instagram and any other social media channels. However, no matter how high your phone camera’s megapixel is, the picture quality will still be quite different from DSLR cameras, especially under low lighting conditions. Sometimes, being the “designated photographer” during a dinner gathering with friends, I have to go through the hassle of unloading the pictures from my SD card onto my computer and then uploading them all to Facebook after the event – and there are always the few gan-chiong friends who can’t wait to get their pictures to setup as their Facebook profile picture. 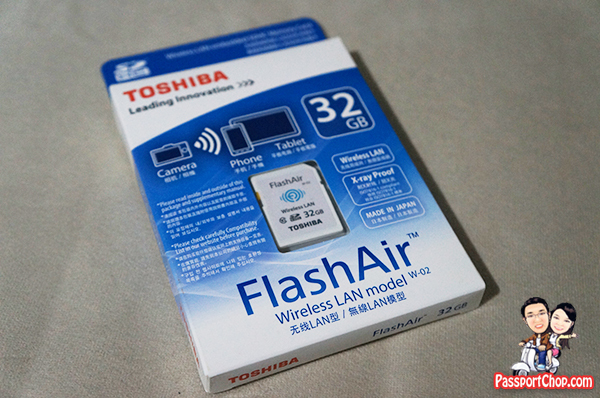 These scenarios are where I thought Toshiba’s FlashAir Wireless LAN SD card would come in handy if you need good quality photos that could be shared with your friends immediately. Smartphones fall short for many key photography moments which require zooming, high-speed shooting, low light etc. The FlashAir provides photography lovers with a win-win solution: great quality pictures and videos of a digital camera and instant access on the smartphone to enjoy and share on your social media channels. For a quick overview on the features of FlashAir, you can check out this short video below. The FlashAir SD card is equipped with a built-in Wi-Fi access point and web server. 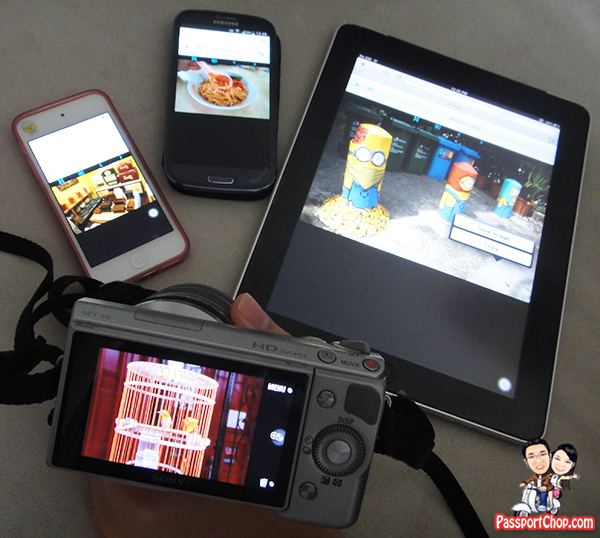 You can still take photos as per normal and you can perform the additional function of being able to connect wirelessly to your FlashAir SD card directly from your Wi-Fi enabled smartphone or computer. The best thing about FlashAir is that it works perfectly right out of the box – just plug it into your camera and switch the camera on, use your Wi-Fi enabled device to connect to the FlashAir SD card’s specific Wi-Fi network (just look for SSID named “flashair_xxxxxx” where xxxxx will be unique for each SD card) and login with the default password (12345678) and you are good to go! The key difference between FlashAir and the rest is you can connect to your FlashAir’s Wi-Fi network and just download whatever pictures you need; other brands will just push out all the pictures to you and this can result in a very long waiting time especially if you have taken lots of pictures! Data sharing by multiple connections simultaneously – the Access Point created by FlashAir can be accessed by several Wi-Fi enabled remote hosts at the same time (as shown in the picture below). Each device can browse the pictures in the FlashAir SD card independently i.e. other users can choose the picture they want to view while connected to the same FlashAir SD card! You can also send pictures in your FlashAir SD card wirelessly to your Wi-Fi enabled computer to back-up the photos. The FlashAir SD card can connect up to 7 devices at the same time but do note that too many concurrent connections could slow down picture viewing and downloading. You should change your FlashAir’s SSID and password after logging in for the first time – you wouldn’t want strangers connecting to your FlashAir SD card to view your photos (and drain your camera battery at the same time!) using the default “12345678″ password. Editing the network settings is simple – just click the Setup menu in your browser and then click Network Settings and you will be brought to a page where you can edit the fields accordingly (The password needs to have at least 8 characters). 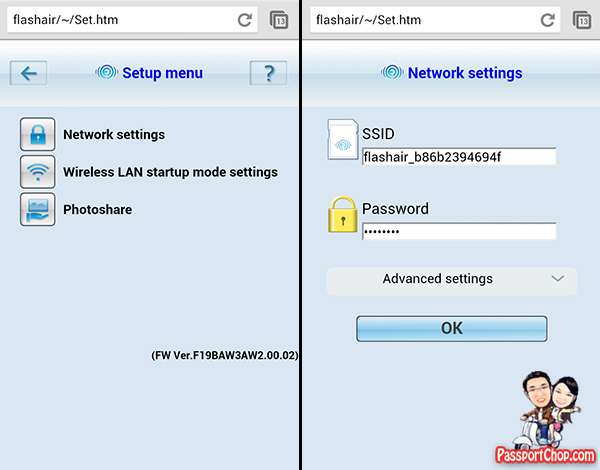 Do note that if you delete the default password and do not enter a new password, the WLAN channel of the FlashAir SD Card will not be secured anymore and anyone could connect to its Access Point! 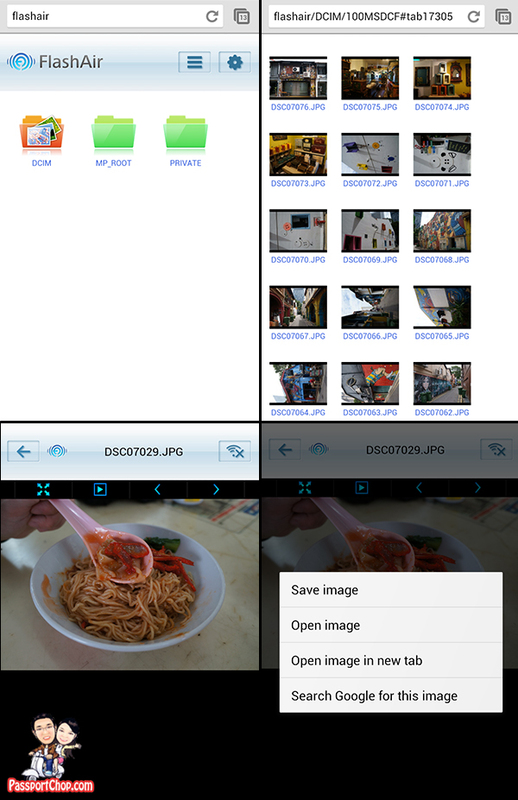 The current firmware of FlashAir SD card features a ‘internet pass-through’ mode that further simplifies photo sharing. Once a mobile device is connected to the FlashAir card, the internet pass-through functionality enables the device to access the internet via a wireless access point. This removes the need for users to swap between a WiFi connection and the FlashAir card when uploading images to social media sites. The initialisation/setup time for FlashAir SD card when it is plugged into the camera is almost the same as that of a normal SD Card. I experienced no lag when browsing pictures stored on the FlashAir SD card from my phone. Each photos is written onto the FlashAir SD card instantaneously after I took the picture – thanks to FlashAir’s Class 10 speed rating; there is no lag at all and I can take multiple shots very quickly. The amazing thing is that each new photos showed up almost immediately on my phone browser after the picture was taken. FlashAir is definitely much more responsive than the other wireless SD cards I have used. As seen in the screenshots below, browsing of the FlashAir’s folder directory is simple – just tap through the folders to reach the picture you want and then tap and hold the file. Then tap “Save image” on a pop-up option list to start downloading the file. If you want to share with your friends only certain pictures on the FlashAir SD card, you can setup the Photoshare function where you will be issued with a temporary SSID (photoshare_xxxxxxxx) and password which only grants access to those pictures/folder you have marked to be shared! The problem with all wireless SD cards is that they drain the host camera’s battery. Optimized for battery powered devices, the wireless function of FlashAir is switched ON only when necessary, keeping the power consumption low – however, you should still be prepared with extra batteries as extended usage of FlashAir’s Wi-Fi functions can still take quite a toll on your camera battery. There are 2 wireless LAN startup mode – automatic or manual; Automatic startup mode is much more convenient – the wireless functionality of the FlashAir SD card runs automatically when the camera is turned on. If. there is no attempt to connect to FlashAir from an external device within the time set in the card’s timeout setting, the wireless LAN functionality is automatically turned off. If you are concerned about camera battery life, you might want to explore the manual startup mode which involves write-protecting of a selected picture to turn on/off the wireless LAN functionality. 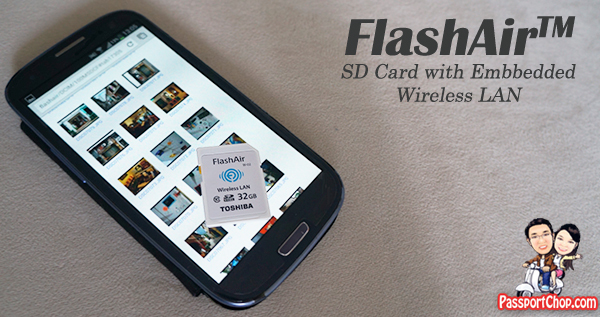 For more information about the Toshiba FlashAir SD card, check out http://www.toshiba-memory.com.sg. Some interesting facts about Toshiba – Toshiba is actually the company that invented Flash memory. Toshiba had also set up the SD Association with other partners that develops and publishes technical standards for SD technology, which means their products go through the stringent process of making sure they all pass the SD Association’s SD technology test. In my experience – IT DOES NOT WORK out of the box. It connectes to my WiFi enabled device – which then immediately disconnects as it does not see internet on the card. Tried to update it using the ridiculously poorly designed Toshiba website, this does not owrk either. In my opinion, Toshiba should stick to making nuclear reactors for Japan – we all know how good they are! My expensive card is not just a memory card – not a very good one at that. just purchased the said flashair with the same capacity. 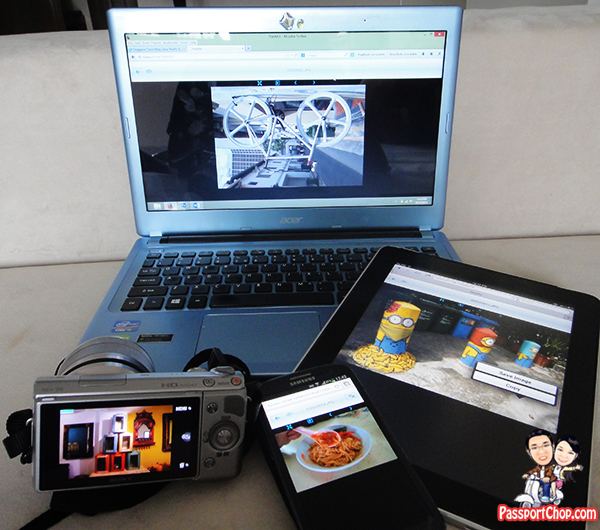 but it is not working with my nikon d90 dslr. i thought, since i’m using an ordinary sd hc card, this thing will work also. when i checked the compatibility list as of may 2014, unfortunately, my dslr model is not listed. does anyone knows any workaround with regards to this so it will work on my nikon d90? That is i assume there are no pictures on the flashair card – because everything will be erased and resetted to factory format then you can try setting your password again or just keep it as it is (if it is causing you problem). Tried formatting, that doesnt work either. Not worth the trouble of messing around any longer. FYI, I bought the card brand new with the camera from a Nikon dealer, it is compatible, I sent the card back to Toshiba, they eventually sent me another – they take 4 weeks + to respond to an email, the new card does not work properly either. As I see from other blogs, many others have the same issue – it is just junk – a waste of money. How do u delete flashair photos without deleting app off my iPhone? is it possible to connect multiple camera’s with a wifi sd card to 1 pc? i have 12 GoPro with with 12 wifi sd cards.Can they connect to my pc/ can I save all my captured photo;s to my pc? i think only one connection at a time. The reason for read error is because of power saving mode of the camera preventing three wifi card from power up. If your camera is Nikon you may try this http://www.tgreer.com/flashair-also-works-with-nikon-d90-if-the-exposure-time-standby-increased.html.